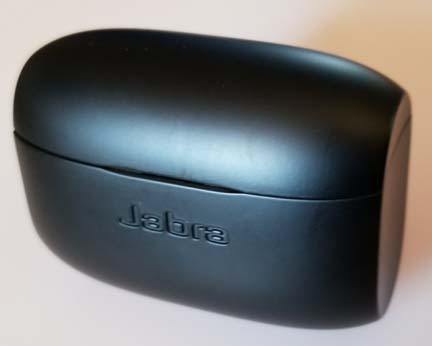 At CES 2018 Jabra released its newest completely wireless earbuds, the Jabra Elite 65t. These earbuds refine some of the design characteristics and features of their very successful Elite Sport earbuds that were released in 2017. 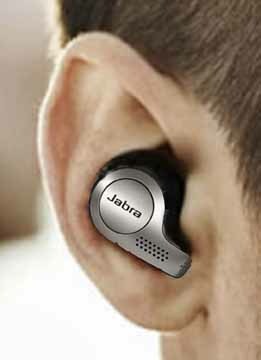 You can read my Elite Sport review online at <http://www.technologytoday.us/Jabra-Elite-Sport-Earbuds-Review.html>. The redesign of the earbuds was, in my opinion, all positive but the redesign of the case was not all positive. The first thing our testing determined is that the Elite 65t will work equally as well with your Apple or Android smartphone. See photo 1. 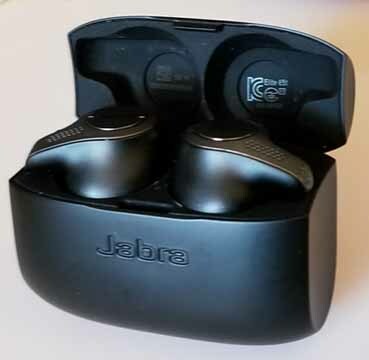 Jabra was able to refine the design of the Elite Sport so the rubber ear wings that were necessary for a correct ear fit aren’t needed on the Elite 65t. They include three silicone buds for you to try to determine which one gives you the most comfort and the best passive noise cancellation. To reverse noise cancellation they give you “Hear Through” that lets these earbud’s built-in microphones transmit environmental sounds to you through the earbuds speakers. 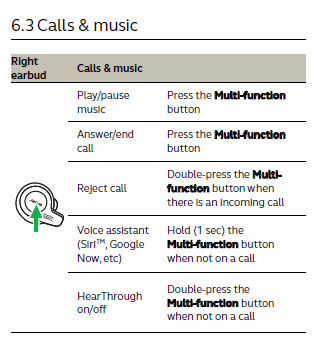 A double press of the right multi-function button engages this feature. 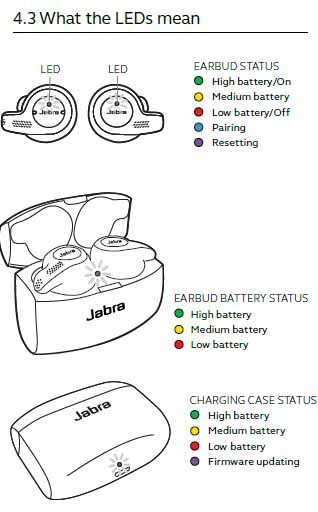 To see what the different lights on the case and earbuds mean and how to control the different features using the buttons on each ear bud check out these illustrations. Of course small technology has to have small batteries and fully charged these buds can give you about 5 hours of play or phone time. Their carrying case is a charger and when it is fully charged it can recharge your earbuds 3 times bringing total use time to around 15 hours. 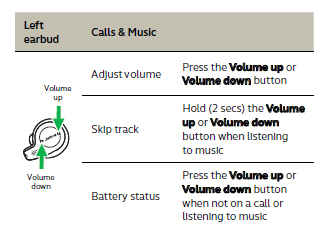 Obviously that is not 15 hours of straight use since the earbuds need to be in the case for rapid recharging to take place. It will take about an hour to fully recharge the earbuds in the case and about two hours to fully recharge the case when it is plugged into a charger or power outlet. 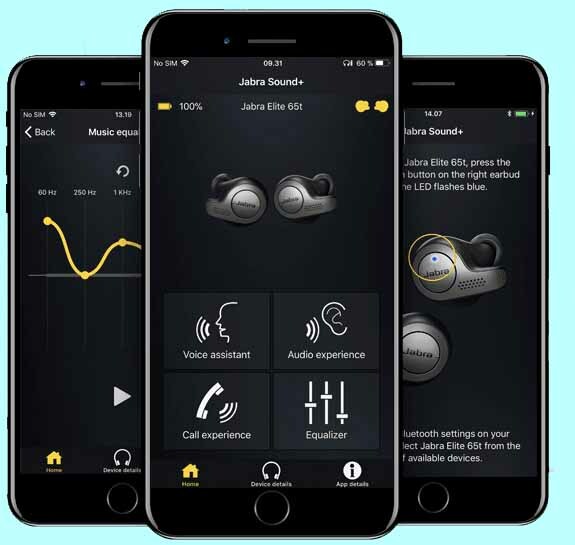 The Jabra Sound + app can enhance your experience with these earbuds and it is available at the Apple App or Android Play stores. You use this app to customize your experience by tweaking your audio, tracking battery power, selecting a voice assistant, and determining if a software update is available for your earbuds. They carry an IP55 rating which means it is reasonably protected from dust and a spray of water. If you register these earbuds using the Sound + app they do give them a two year warranty against dust and water. The Elite Sport has an IP65 rating which means that they can survive being fully submerged in 3.28 feet of water for at least a half hour. The Elite 65t has a lower rating than the Elite Sport and you don't want to accidentally drop them in water. When you take these earbuds out of their case they automatically start to work and they tell you they are paired with your phone. When you place them back into their case they also automatically shut off for rapid recharging from the built-in batteries in the case. They are comfortable to wear, have very good volume, and decent sound reproduction. your fingernail to pry open the case.